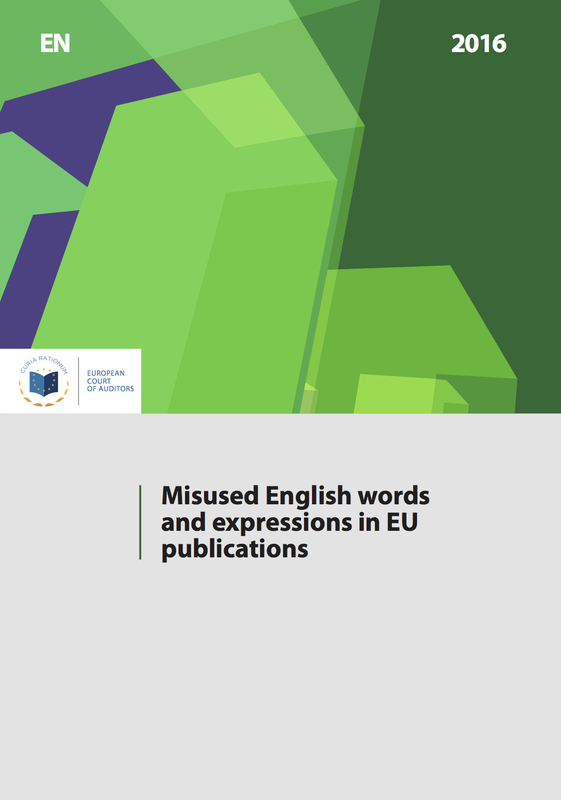 The European Court of Auditors makes available a free, downloadable 59-page guide entitled Misused English words and expressions in EU publications. As far as I’m concerned, it is precious far beyond the EU’s own publications – these issues come up regularly in all kinds of situations. The list of “ouch” terms was produced using a corpus of texts from the Court of Auditors, and supplemented by individual English-speakers. It was then checked against dictionaries, checked with UK native speakers, and the British National Corpus. Each term is followed by an explanation, examples, and alternatives. Anglo-Saxon. Used instead of English-speaking. This is one that makes me scream out loud. Please listen – the whole of France!! Reasonability. What can I say? Hat tip to Rob Lunn for making me aware of the guide. What a great remedy for too much autopilot in EU writing and translating – may it spread far and wide and eliminate “sickness insurance” (a terrible direct translation from French). At the same time, the guide may overgeneralize a bit and often lacks real grammatical explanations which generally *do* exist – e.g., “a screening” is not “impossible in English” (for a film screening, what else do you call it?) or even “a training” (if we’re talking about a specific seminar – I realize this is regional though). Of course they may not work in all contexts or especially combined with non-English syntax and other Eurospeak formulations. I’m not a native speaker of soon-to-be-ex-European English either, so I’ll defer to BE speakers on those. It’s clearly progress but it could be improved in both the descriptions and in making more helpful suggestions than “put the words the right way round” which mainly seem to express the author’s (understandable) frustration. Looking forward to the next edition already! Pingback: (TOOL) (PDF) – Guide to misuse of English | From Words to Deeds – 📚 Glossarissimo!